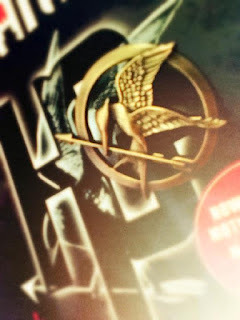 I managed to catch The Hunger Games a month back when the movie was just released in the cinema, and the plot deeply piqued my interest in the trilogy. I decided to pick up all three books at my bookstore (there was a 10% discount, all the more worthwhile!). I've not finished reading all the books due to my busy schedule, but I'm sure I'll get around it soon when summer break kicks in. I also got a replica of the pin that Katniss Everdeen, the heroine of the series, donned throughout the books/ movie. It's quite a cute little pin, and now it sits neatly on my bookshelf with the three books. It's quite a nice and sturdy replica, with the mockingjay details well-etched on the bronze metal. The pin is a stud one (not different from the tiny collarpins), hence the prong is a bit too thick for my liking and I doubt I will be using it as an accessory. Instead, it'll be on my bookshelf together with the books. Can't wait to read the books soon!